We are pleased to announce the publication of fourteen important and hitherto unknown works by Carl Friedrich Abel held in the Kulukundis Collection. 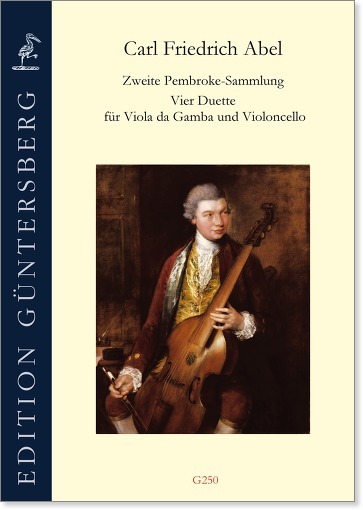 The works in question are four Duets for viola da gamba and violoncello and ten Sonatas for viola da gamba and basso continuo, which Abel composed for the Countess of Pembroke (gambist) and her husband (cellist). 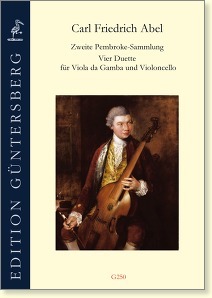 In order to distinguish it from the well-known Pembroke Collection - which contains numerous sonatas for viol with and without basso, and is preserved in the composite manuscript Add. Ms. 31697 in the British Library - we refer to these works as the Second Pembroke Collection. The editor, Thomas Fritzsch, considers these demanding, mature, and expressive pieces to be late works. - The rendition of these works on the two different instruments is certainly quite charming and unusual. On the other hand, the parts do not display any idiomatic characteristics, so that the duets could also be played on two equal instruments (viols or cellos).